Holiday Inc. is in the Business of Fun! Hey everyone! Travis back with more Tampa Bay entertainment options during the holidays. This time we are talking about a brand new show, never before seen in the Tampa Bay area...or anywhere else for that matter! This enchanting spectacular will premier for the first time in Tampa Bay, filled with dazzling effects, stunning costumes, Broadway caliber performers, loveable characters, high energy dance numbers and a chart-topping song list...it will certainly be the holiday show experience that&apos;s as close to the big apple as you can get! The Story of Holiday Inc! will unfold as the cast transports the audience to the North Pole. Holiday Inc&apos;s Board of Directors, Tinsel Garland, Figgy Von Nog, Angel Divine, Frankie Feliz, and Hearth Tannenbaum who are anything but conventional will be called to a meeting to help one unbelieving elf realize that her drams of what the season means is right in front of her. There are loads of surprises, humor and much more! 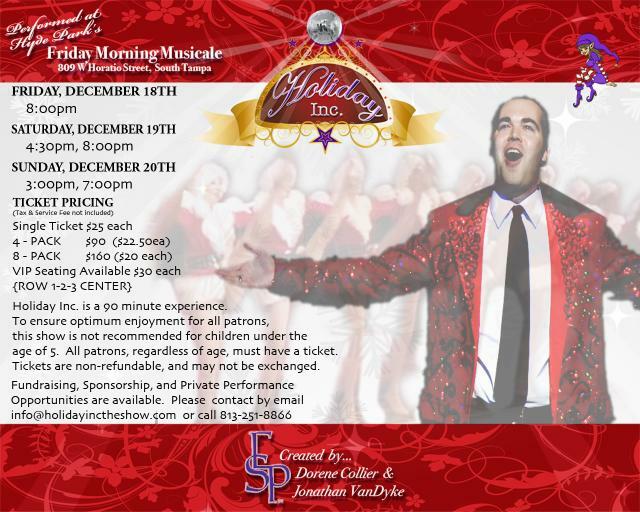 If you need more info about the show, just log on to www.holidayinctheshow.com! The show takes place in historic hyde park at Friday Morning Musicale (809 Horatio Street in Tampa). Tickets are $25 each, but there are discounts if you are buying a 4-pack or an 8-pack...or more! Friday, Dec. 18 at 8pm. Saturday, Dec. 19 at 4:30pm and 8pm. Sunday, Dec. 20 at 3pm and 7pm. I&apos;ll see you out there. Like I said, if you want more information, just log on to www.holidayinctheshow.com. And as always, keep checking back here for more great things to do in Tampa Bay and other Tampa Bay area events!